Special Containment Procedures: When not in use, instances of SCP-XVX are to be contained in airtight containers packed with silica gel and stored inside an electrically heated safe in a 0% humidity environment. The room containing the safe is to be guarded by at least two guards at all times. Access to this room requires Level 3 security clearance or higher, plus written approval from Level 4 personnel. Use of SCP-XVX is strictly limited to research purposes, as it poses significant danger to users and the Foundation. Any misuse is grounds for severe reprimands and possible reassignment. SCP-XVX is not to be exposed to direct sunlight under any circumstances. Personnel must handle any instance of SCP-XVX with utmost care when it is removed from its container. No female personnel are allowed within 500 meters of any instance of SCP-XVX. Only D-class personnel may handle SCP-XVX directly during testing and at least two armed guards are to accompany the subject at all times. Any command made during the experiment, verbal or otherwise, is to be strictly monitored. Issuing commands that potentially lead to harm or disruption of containment protocols is forbidden, and offenders will be executed on the spot. Experiments involving instances of SCP-XVX are to be conducted in a closed room with ambient temperature of 45oC. In the event that SCP-XVX breaks containment, an emergency heating system will be triggered to raise the facility’s air temperature to 45oC and personnel are to be supplied with incendiary weapons. Edit: As of ██/██/████, personnel will also be supplied with children's toys to help contain SCP-XVX-1. Refer to Addendum [SCP-XVXb] for explanation. 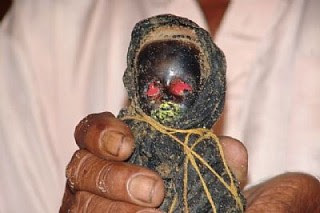 Description: In its 'inactive' stage, an instance of SCP-XVX appears as a mummified fetus measuring 20 to 25 cm long. Currently, the Foundation has three instances of SCP-XVX in containment, designated SCP-XVX-1 to SCP-XVX-3. As of ██/██/████, only SCP-XVX-1 and SCP-XVX-3 remain in Foundation custody. It is inanimate, and therefore harmless, when inactive. It is rather fragile in this state: exposure to direct sunlight and blunt trauma causes it visible damage. While SCP-XVX instances can recover from damage over time, exposure to sunlight for extended period of time will cause them to deteriorate such that they become permanently inactive. An instance of SCP-XVX must be immersed in water for an hour for it to enter ‘active’ state. When active, SCP-XVX's size increases by 300% and it becomes fully autonomous. It also displays problem-solving capability indicative of high cognitive function. SCP-XVX will form a ‘bond’ with the first person it sees upon emerging from the water and will obey any command the person issues. Edit: Recent experiments have found that SCP-XVX does not bond with females. If the first person it sees upon emerging from the water is female, it will immediately turn on her. An active SCP-XVX displays the ability to phase through solid objects, which it uses to carry out the tasks it is ordered to do. The subject is also able to choose what could interact with it. This power makes SCP-XVX perfect for thievery and sabotage. When SCP-XVX successfully fulfills an order from a bonded human, it will ask for a prize. Subject will usually ask for [REDACTED] female personnel or [REDACTED] as its reward. Once it receives the requested reward, the subject will return to its inactive state. If not given the requested reward, however, it will break the bond and cause general havoc by sabotaging everything it can reach. This will also happen if the bonded human dies while the subject is active. Although it possesses only the speed and strength of a 3-year old human child, an activated SCP-XVX is indestructible. Active SCP-XVX instances have shown the ability to reattach or regrow broken body parts. The only way to disable an active instance of SCP-XVX is to expose it to a strong heat source, which will dehydrate and deactivate it. It is thought that many instances of SCP-XVX remain unaccounted for, as they are relatively easy to produce. The procedure to do so involves [DATA EXPUNGED] and to mummify them in a place where no sunlight can reach. The possible existence of unaccounted-for instances of SCP-XVX should be taken seriously, as it has the potential to disrupt the Foundation's containment protocol. Recent testing found that SCP-XVX may fail to carry out its given orders. All known instances of SCP-XVX exhibit an impulse to play with toys, which will distract them from their task. What is considered a ‘toy’, however, seems to differ with every instance: SCP-XVX-1 can be sufficiently distracted with glass marbles, while distracting SCP-XVX-3 requires [DATA EXPUNGED]. Note: Although SCP-XVX has the potential to greatly harm the Foundation, O5-██ has decided that all instances of SCP-XVX are to be categorized as Safe for the time being. Request to upgrade classification to Euclid is pending more study. Procedure: SCP-XVX-2 was submerged in one (1) m3 of pure water until it reached active state. Handler was instructed to order the subject to walk through several solid obstacles made from materials commonly used to construct the Foundation Keter-class containment cell. Result: Subject entered active state after 60 minutes and 2 seconds of immersion. Upon sighting D-14332, subject turned hostile and proceeded to [DATA EXPUNGED]. 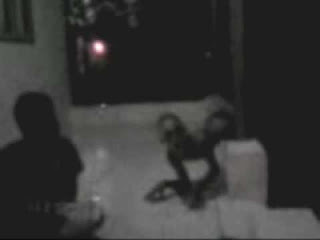 Guards failed to separate the subject from D-14332 because it did not allow the guard to make physical contact with it. Once it [REDACTED] D-14332, subject phased through the southern wall and attempted escape. Subject was subdued an hour later, after SCP-XVX-2 went into permanent inactive state after 15 minutes 22 seconds of sunlight exposure. Remains of SCP-XVX-2 were collected for future study. D-14332 expired two days after the incident. Autopsy on her remains revealed severe tearing of her [REDACTED], leading to acute infection. Large amount of arsenic was also found in D-14332’s blood. Testing concluded that females are incapable of bonding with SCP-XVX. New precautionary measures have been implemented into SCP-XVX containment procedure to prevent similar incidents as of ██/██/████. Foreword: As part of the research agenda proposed by Dr. Z. ██████, an interview with an owner of an SCP-XVX instance was scheduled on ██/██/████ in ██████, ████ ████, Indonesia. The interview has two purposes: purchasing the SCP-XVX-3 and to glean more information about the properties of SCP-XVX. Note: Interview taken secretly using a hidden microphone and was conducted in Indonesian. Translation might contain errors. Mr. Kukuh: “Aah, I’m used to be visited by people. C’mon in sir. My wife’s is serving lunch just now. Mr. Kukuh: “Where is the one you bought from me six months ago? Mr. Kukuh: “How did that happen? That’s why you need to be careful, sir doctor. Well, I’ll make you another one later but it’ll take a while. Dr. ██████: “I heard that your █████ is the best in the province and I’m more comfortable talking to you, sir. Closing Statement: Mr Kukuh agreed on making another instance SCP-XVX, to be collected at ██/██/████. The interview also revealed the method of making SCP-XVX instances. For details regarding the procedure, refer to [Document removed under the order of 05-█]. Mr Kukuh statement indicates that he is not the only maker of SCP-XVX. Dr. Z. ██████ admitted himself to the psychiatric wards immediately after his return for a full mental health check-up. He refused to come out from his quarters for 78 hours. An hour after the collection of SCP-XVX-3, Mr. Kukuh and several shamans from neighboring villages were detained by FPI (Front Pelindung Indonesia) operatives. Those who were not caught escaped without a trace. Proposal suggesting that FPI should be put on the Foundation’s watch list is pending further negotiation. Whereabouts of Mr. Kukuh and other detainees remain unconfirmed to this day.